Looking for print details and clarification on sizes? Want to find out about shipping & returns? Need dimensions for our framed prints? Our fine art prints feature real live animals, photographed by renowned photographer Sharon Montrose who has been capturing the beauty and charm of animals since 2004. We pride ourselves on quality and it’s important to us you that enjoy your prints for as long as they adorn your walls. Paper and printing materials make a difference. Our photographs prints are made under Sharon’s supervision with her high-resolution files using the finest heavyweight 100% cotton acid-free photo paper, archival pigment inks, and custom printer profiles that produce prints of unmatched quality you can truly see and feel. 7″ x 9″ and 10″ x 13″ sizes are open editions. Larger sizes are limited editions. Open editions (7″ x 9″ and 10″ x 13″) are initialed by Sharon en verso (on the back). Limited editions are signed and numbered by Sharon en verso (on the back) and come with a signed and numbered certificate of authenticity that can be affixed to the back of the frame (once the photograph is framed). The image size reflects the actual image area. We leave an ample white border around the image area to protect it during shipping (paper size) and to avoid fingerprints while being handled. Extra border can be trimmed carefully if needed for framing. Use caution if you are trimming your print. 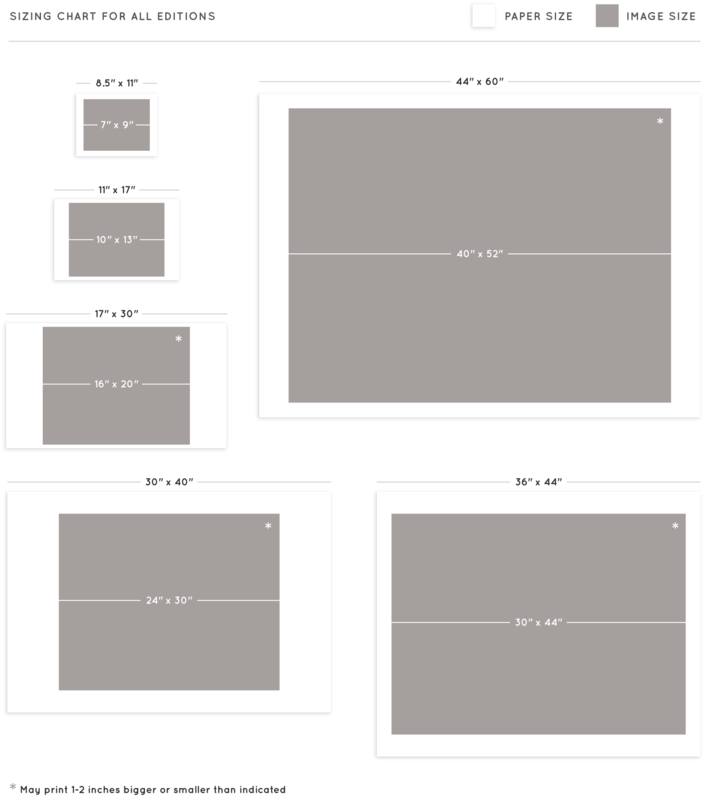 See our SIZE CHART below for unframed print dimensions. $5 Flat Rate shipping on all orders (USA only). Unframed Prints (7″ x 9″ and 10″ x 13″) ship in 1-3 business days plus transit. Limited Editions (unframed) ship in 10-12 business days plus transit. Framed Prints (7″ x 9″ and 10″ x 13″) ship within 1-2 weeks plus transit. Transit times can be found in our shipping section. We’re a small operation–we appreciate your patience! See our shipping section for international shipping prices (customs fees may apply. please inquire with your local customs agency). Our fine art photographs and custom frames are made-to-order. Therefore, we do not accept returns. Unframed prints may be exchanged within 30 days of delivery. Framed prints are final sale. Any exchanged items must be unused and in all original packaging. Shipping is non-refundable. Non-deliverable orders are subject to a 20% restocking fee. Email us for Exchange authorization and shipping instructions. 7″ x 9″ fits in most ready-made 8″ x 10″ frames. 10″ x 13″ fits in most ready-made 11″ x 14″ frames. We’ve done the work of you! See all our favorite ready-made frame recommendations. Keep photographs in their sleeves until they can be framed. Do not hang photographs in direct sunlight. Be sure all framing materials that come in contact with your photographs (mat, tape, backing) are archival or acid-free. For your convenience, we offer sizes up to 16″x20″ professionally framed and ready to hang right out of the box. Professionally assembled in Los Angeles, CA at prices competitive with most local custom frame shops. White solid wood moulding, fitted with acrylic (not glass) and finished with a protective backing, bumpers and hanging wire. The perfect way to give photographs as a gift! Choose an archival beveled mat with 1/4 border reveal or set-back gallery style with no mat. Frames only available in white. Our framed prints are made-to-order. Not eligible for return. 7″ x 9″ WITH MAT: The outside dimension once framed is 14” x 16”. 7″ x 9″ NO MAT: The outside dimension once framed is 9” x 11”. 10″ x 13″ WITH MAT: The outside dimension once framed is 18” x 21”. 10″ x 13″ NO MAT: The outside dimension once framed is 12” x 15”. 16″ x 20″ WITH MAT: The outside dimension once framed is approximately 25.5” x 29.5”. 16″ x 20″ NO MAT: The outside dimension once framed is approximately 19” x 23”.